Blancpain GT Series Endurance Cup: MONZA. Silver Cup Victory ! A Silver Cup victory to launch Team AKKA-ASP’s 2019 season! Monza, the Italian temple of sport, was the scene of the first round of the Blancpain GT Series Endurance Cup. The 2019 season got underway with a race full of twists and turns (with tricky weather conditions) during which Team AKKA-ASP was in front on many occasions. With the race pace determined by the many rain showers and daring tyre choices, this first event finished with a superb victory in the Silver Cup (4th overall) after claiming pole position, for the trio of Nico Bastian, Timur Bogulavskiy and Felipe Fraga in the #90 Mercedes-AMG GT3. One of the star crews in practice (1st in pre-qualifying and 4th overall in qualifying) as well as in the race, the drivers of the #88, Raffaele Marciello, Vincent Abril and Michael Meadows, shined throughout but were unable to bring their car to a well-deserved conclusion after a broken shock absorber 20 minutes from the chequered flag. Leaving Italy with no points, the Pro-AM crew of the #87, Jean-Luc Beaubelique, Jim Pla and Mauro Ricci, were definitely on the pace but were forced to retire mid-race, having gone off further to contact, while leading their category. The championship hit the ground running, promising a thrilling and exciting season ahead. After their 2018 titles in the Blancpain GT Series, the winter break had not dented Team AKKA-ASP’s motivation to launch themselves towards new conquests. With three solid, experienced driver line-ups, entered in the Pro, Silver Cup and Pro-Am categories, Jérôme Policand’s team headed back to the track with their competitiveness intact, both in the dry and under the torrential rain. In free practice, all the competitors were getting their bearings, and as early as pre-qualifying, the lap times started coming down. Behind the wheel of the #88 Mercedes-AMG GT3, Raffaele Marciello, sharing the car this year with Vincent Abril and Michael Meadows, was the fastest. This tendency was confirmed the next day during qualifying, when, despite the conditions made more complicated by rain and reduced visibility, the trio claimed the fourth position on the grid. 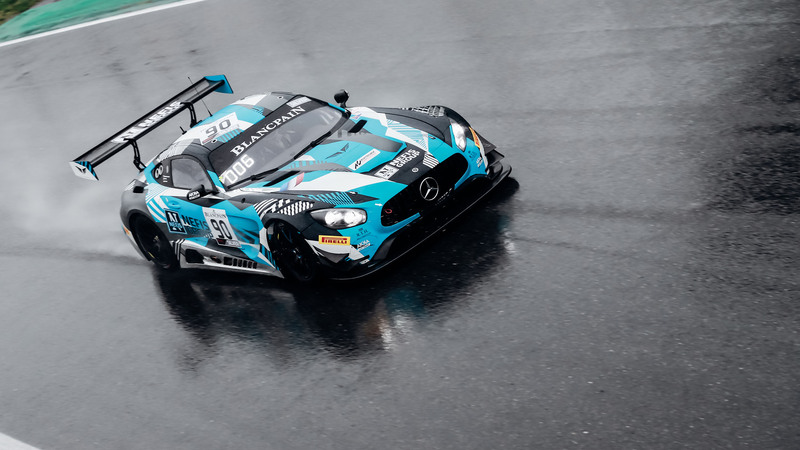 The #90 Mercedes-AMG GT3 of Nico Bastian, Timur Boguslavskiy and Felipe Fraga was equally energetic and successful, resulting in pole position in the Silver Cup, and a place on the first row of the grid (P2) ! As for the Pro-AM crew in the #87 car, of Jim Pla, Jean-Luc Beaubelique and Mauro Ricci, they put in some fine performances, including a third-fastest time in the first session, but were delayed by gearbox problems (which resulted in an off-track excursion, damaging the front and the wing). They claimed a place on the 20th row of the grid. Just a few hours after Qualifying, this first race of the season appeared, just like the qualifying, to be subject to the caprices of the weather, and the race started behind the safety car. The rain, spray and reduced visibility did not give optimal racing conditions, but despite all expectations, the pack went carefully through the first corners when the safety car pulled off. The pace of the next three hours of racing was set by a number of Full Course Yellow interventions, as well as safety car periods. At the start of the race, the #90, second on the grid, held on to his position, Nico Bastian behind the wheel. After fifteen laps, the German driver was in control of the race, while his team-mate, Vincent Abril in the #88, was lying fourth and setting a solid pace. Starting from the 20th row, Jean-Luc Beaubelique was pushing hard and gaining positions lap by lap, lying fourth in the Pro-AM category.